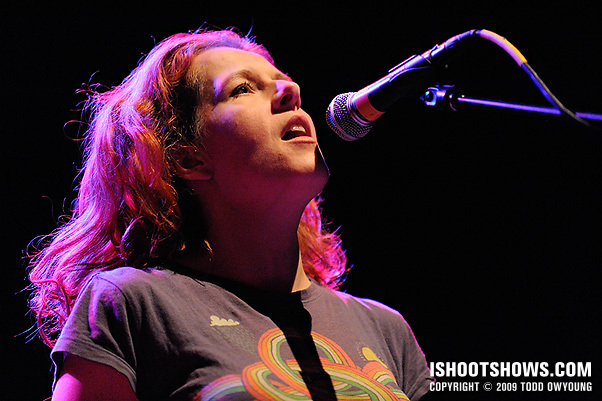 Under simple lighting, songstress Neko Case delivered an light and lively show. With a dim stage treatment, I broke out the fast primes and utilized VR to bring it home. This show was super simple. 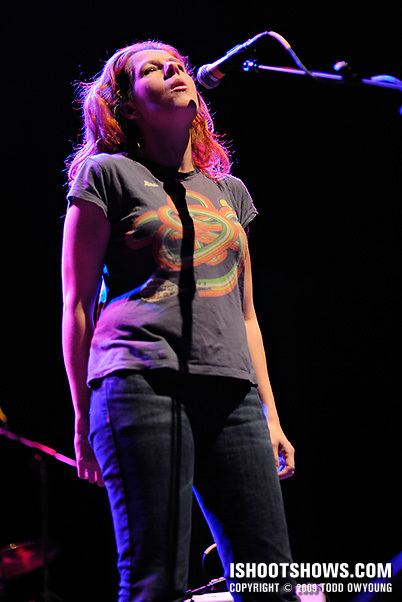 Relatively low light and little movement on stage for the first three songs meant that Neko Case's performance was a straight forward assignment. With Case positioned at the mic, the choice in angles was basically stage right or stage left, or some small variation in between. The singer was set back from the front of the stage by about a meter or so, which was a benefit for photography. A closer position would have meant more severe angles, so I was happy to see this slightly more forgiving setup. 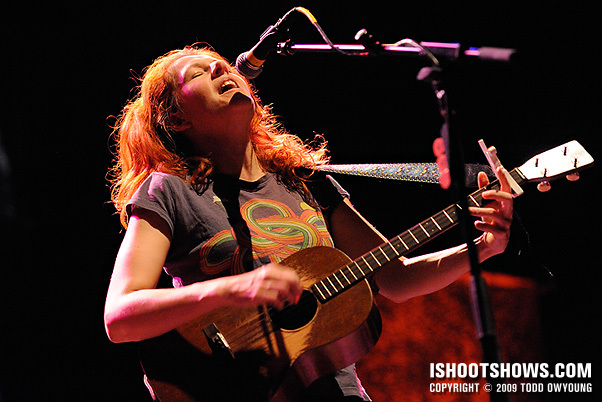 Neko Case holds here guitar relatively high, so I favored stage right for most of her set. 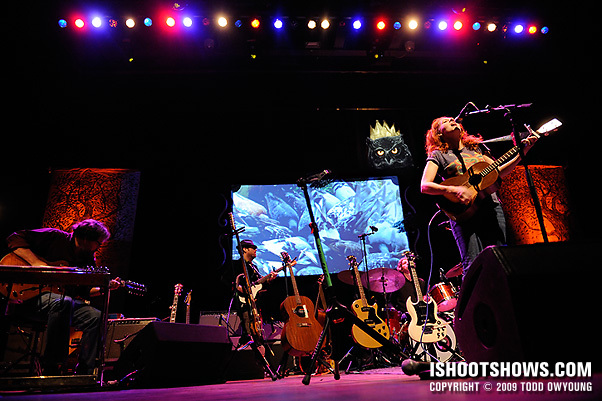 One small factor to consider for Neko Case was that her setup featured two guitar stands in front of her on either side. The Pageant's stage is relatively high, so this was a factor in choosing angles, but if you're covering this show at a venue with a lower stage, the stands shouldn't be much of an issue. 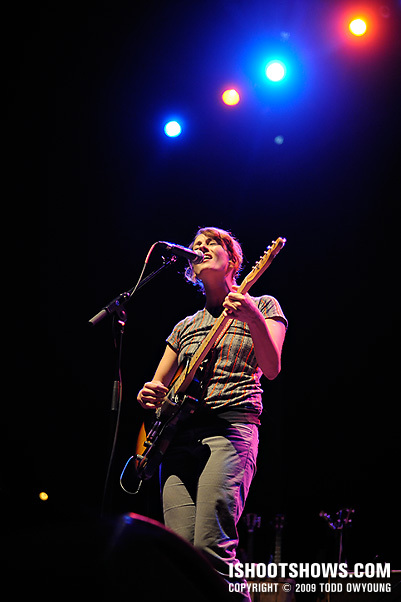 Opener Sarah Harmer was similarly a pretty straight forward shoot with no real tricks. If anything, I think she actually had slightly stronger lighting. I shot this set primarily with the Nikon 85mm f/1.4 and Nikon 70-200mm f/2.8, though I also used the Nikon 50mm f/1.4 and Nikon 24-70mm for a few snaps as well for wider perspectives. Todd, fortuitous that you posted this…I’m shooting Neko tmrw night. unfortunately it’s at a venue w/o a photo pit, so i’ll try to get to stage right side. 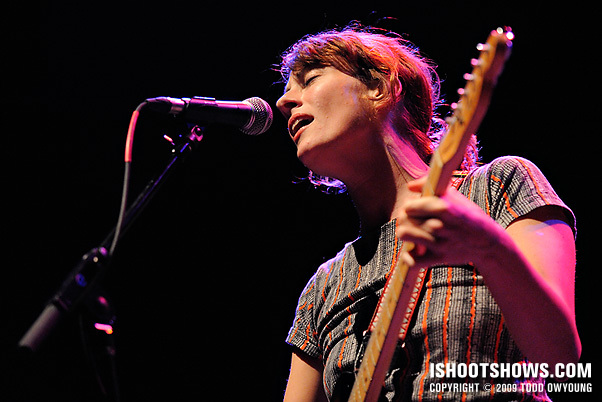 was there anyone in Neko’s band worth shooting? Sorry for the late reply, how’d the shoot with Neko go? Hope the shoot went well, Tim – I didn’t really focus on anyone in particular in the band aside from Neko, as everyone else was rather poorly lit. Hope you faired better for the support. well as fate would have it, my photo pass was for opener Calexico only, not Neko. kind of a bummer, but apparently passes were pretty strict (I did go through Calexico’s PR firm for my pass/ticket), and i didn’t see anyone else shooting. i did enjoy a delicious meal of cambodian vermicelli, and didn’t get a parking ticket either, so that was a win (and the show overall was excellent).